R on windows has much slower versions of the log, sine and cosine functions than are available on other platforms, and this can be a serious performance bottleneck for programs which frequently call these math functions. The reason for this is that the library R uses to obtain the log function on windows (libmingwex.a) contains a version of the log implementation which is out of date relative to more modern code and much slower than other available versions. That the glibc implementations of common math functions are slow is a known issue that others have discussed on the internet. This post uses the log function as an example to show specifically why it is slow, and then suggest some quick work arounds for these math functions. Comparing the assembly code of the log function as generated with MinGW on windows with the assembly generated for the log function on Mac OSX shows why the code is slow. Below is the assembly code for log function as decompiled from MinGW (their implementation is basically a cut/paste from GNU libc). The crucial feature here is that most instructions start with an “f” indicating that they are using the floating point registers, and there is one instruction the fyl2xp1 that is one of the most expensive operations out there. This instruction takes a log using hardware, and is known to be slower than most other possible ways to calculate log for modern machines. These floating point register instructions were state of the art way back when, but nowadays most hardware is using special XMM/YMM registers and instructions that can make for much faster code to calculate logarithms (See Section 17 for more information on this). Demonstrating faster assembly code is the Mac OSX implementation of log shown below. The key feature here is that it uses XMM registers and has a more modern and performant implementation. Note that many other implementations (e.g. the Microsoft compiler) also use faster versions like this. That is, Windows is not slow, R is slow on Windows. It’s all the same Intel chips under the hood. Ideally we could just push a faster log implementation to the R core repo for Windows, but the fact of the matter is the R core team does not accept code changes that only improve performance (and fair play to them, R is the most cross platform software out their, and that wasn’t easy to do). Also, realistically the current implementation is feasible for most peoples work. So the solution is to switch out the log function for a better one only when it matters, and if it matters that means most of the library is already written in compiled code. Where to get a cross-platform compatible log function? It seems the folks over at Julia ran into a similar problem with slow Log on different machines. They looked at two version in libm (e.g. Libm Version #1 and Libm Version #2), and also some really crazy implementations such as this one available from Yepp. However, what they settled on is a very good function, and we can port those over directly into R. An example is shown in the pull request here. This entry was posted in Uncategorized and tagged R, Rcpp, Rstats on September 19, 2016 by Nigel. 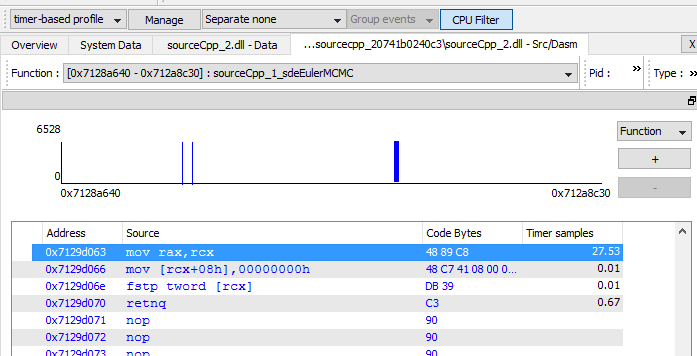 Profiling Rcpp code on Unix/Mac is easy, but is difficult on Windows because R uses a compilation toolchain (MinGW) that produces files that are not understood by common Windows profiling programs. Additionally, the R build process often removes symbols which allow profilers to produce sensible interpretations of their data. The following steps allow one to profile Rcpp code on windows. You can verify this worked correctly by checking that -gdwarf-2 appears in the compilation messages, and that -s is missing in the final linker step. The next key step is to run a profiler which can understand the Unix like symbols on windows. 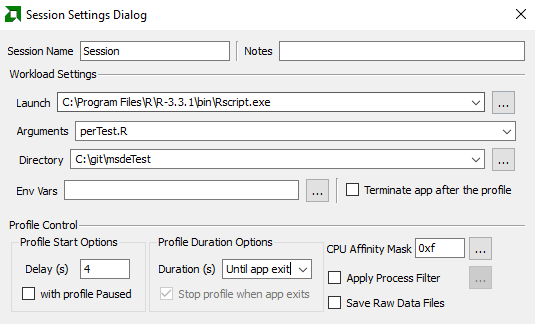 Two free and good options are Very Sleepy and AMD’s code analyst (which also works on Intel chips). Very Sleepy is very good at basic timings and providing stack traces, while AMD’s profiler is able to drill down to the assembly of a process. Both profilers are good but an example with AMD is shown below. Open the program and setup a quick session to start and run a sample R script that uses your code, such as in the example shown below. Its often helpful to look at the original source files in addition to the assembly, and this can be enabled by setting directory information by Tools-> CodeAnalyst Options -> Directories. This entry was posted in Uncategorized and tagged Optimization, R, Rcpp on September 3, 2016 by Nigel.